Beginning with natural pine and other quality woods such as redwood, ponderosa and cottonwood, Carve A Bear! transform raw timber into world-class, one-of-a-kind sculptures and other creations, using a chainsaw to bring these logs to life. 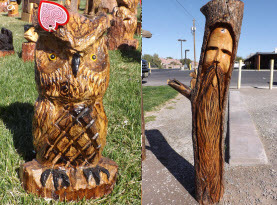 Our decades of expertise in chain saw carving is vivid and varied, ranging from wildlife sculptures and statues to furniture to custom home décor and signs. Feel free to browse our gallery and give us a call to discuss a custom order especially for you. We promise a superior customer experience and amazing artwork that is truly unique, guaranteed to inspire and be the envy of your neighbors. 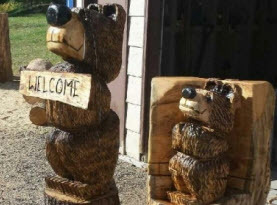 Whether you are looking for chainsaw carved Bears, Dogs, Birds, Horses, Mascots, Coyote, Wolves, Bunnies, Squirrels, Lions, Chickens, Pigs, Garden Wizards, Mountain Men, Raccoons, Cowboys, Indians, Tiki’s/Totem Poles, Custom Furniture such as Benches, Tables and Chairs, Custom Order Name Signs, Mantels, Flower Pots & Memorial Planters or anything else, give us a call or come by today! Tree Stump Removal can be very difficult, dangerous and costly. Plus, many people have an emotional attachment to an old tree they have had for years or even decades. Why not keep the tree stump and have a custom Chainsaw Carving done instead of cutting down the old dead or dying tree and grinding the stump; leaving an ugly eyesore and tripping hazard? 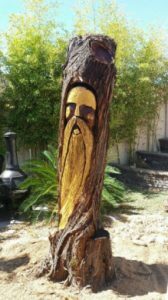 Clark the Carver can give you a quote for a custom carving sculpture that will add beauty and value to your home; and allow you to keep the spirit of the old tree around forever! If you can dream it, Clark can carve it. Call today for a free consultation & quote to add that special touch your property needs. Family name signs make the best gift for a wedding or anniversary, and first name signs are adorable in baby nurseries and kids rooms. Custom name signs are also great for business signage as well as recreational parks and community areas. 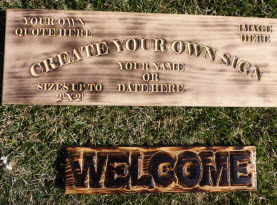 Check out our custom name signs here. Bar stools, chairs, benches, end tables, lamp bases or the base of a glass-top table and much more; Clark can create amazing furniture for your deck or yard, or even inside your home! What better way to remember a beloved pet than with a custom sculpture of their likeness or other pet memorial carving? Perfect as a gift for a family member, friend (or even yourself) who has recently lost a dog, cat or other lovable pet. 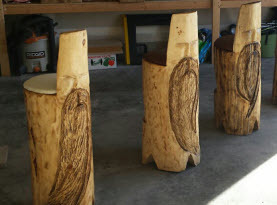 Having a burly, bearded mountain man or two watching over your home or business is the perfect conversation piece that adds charm and intrigue to any foyer, reception area or landscape. Check out Clark the Carver’s specialty: Chainsaw Carved Bears here! Perfect for Christmas, Clark the Carver offers adorable reindeer that make a great gift for a loved one … or even yourself! With their big antlers, moose look great year round, and especially throughout Christmas and the winter holiday season. To leave more about Clark’s Chainsaw Carved Dogs, click here! Clark carves a variety of Chainsaw Carved Birds including owls. Whether you want a howling lone wolf carving or a whole wolf pack, check out Clark the Carvers custom chainsaw carved wolves page for more info!